“The President’s announcement today, while a welcome first step, does not go nearly far enough. The only way to prevent human, economic and environmental tragedies like the BP Deepwater Disaster is to re-enact the moratorium on offshore drilling and to replace dirty dangerous fuels with clean energy. On April 2nd, President Obama said: “It turns out, by the way, that oil rigs today generally don’t cause spills. They are technologically very advanced.” Days later, the BP Deepwater Spill began. One of the President’s first steps to start making the shift to clean energy should be to require that all new cars are manufactured with existing plug-in technologies that run at 100 miles per gallon by 2015. In addition, President Obama should shelve the plans to allow Shell to drill in the Arctic this summer. The Coast Guard calls a spill in the Arctic a ‘nightmare scenario’ due to the difficulties in cleaning spills in the Arctic. If we cannot handle a spill in the Gulf of Mexico, imagine the impact even a small spill could have in the remote, pristine waters of the Arctic. The single, most effective way to attract more birds to your yard is with a fresh water source. Many birds who may may never even visit a feeder, or use a birdhouse require and seek the life sustaining element of water. Birdbaths are a simple and inexpensive way to offer water and attract more feathered friends. The optimal depth of water for birds to bathe and wade comfortably is about two inches. If the bath is deeper, consider placing a large rock in the center for birds to perch. Adding a nice architectural element to a yard, pedestal birdbaths are available in traditional concrete or stone. A heater may be added to these during frigid winter months, when a water source is also crucial to birds. The newer poly-resin material is made to look like stone, but without the weight, they’re much easier to clean too. Hanging birdbaths are a great choice if space is limited, plus they tend to keep birds safer from ground predators. Birds tend to bathe naturally on the ground, and you can even make a nice ground birdbath using a large, attractive plant saucer and surrounding it with rocks or other natural materials. This option is not recommended if ground predators are present in the area. Consider raising the bath by placing the saucer on a large upturned pot. With summer temperatures feeling like they’re getting hotter and hotter, offering birds water may really make the difference between life and death for some of them. 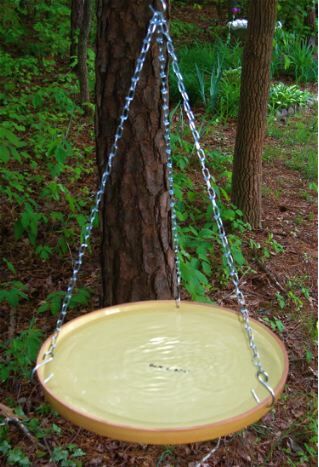 Keeping birdbaths in the yard is most inexpensive, kindest thing you can do for birds in summer! 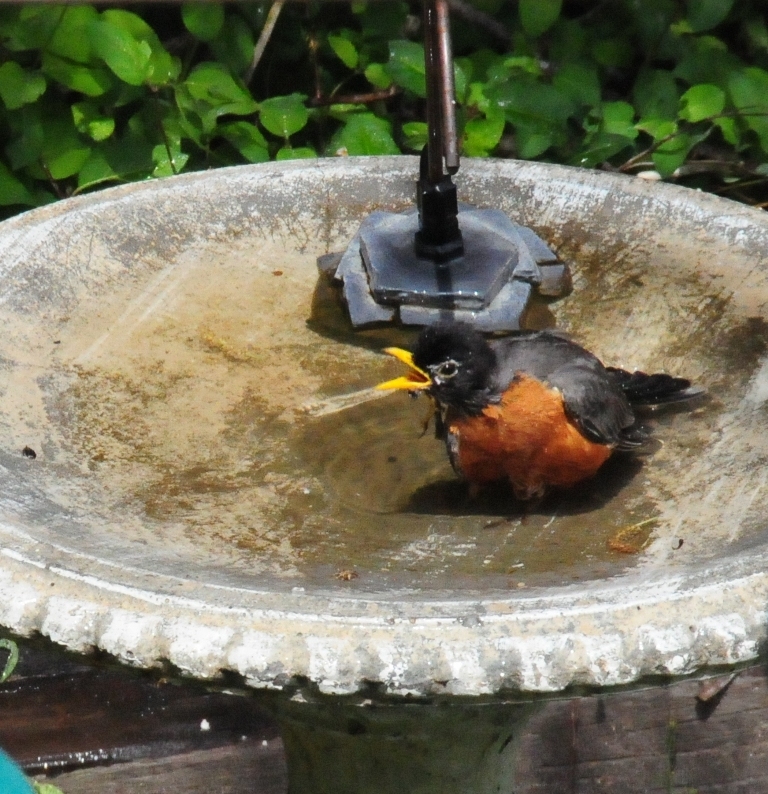 The robin pictured above above has enjoyed his bath so much that he’s splashed all the water out! Good thing there’s another birdbath directly below it for others to partake. As hot as the past few summers have been, providing a fresh water source for feathered friends is crucial. It’s a life-saving element in many instances. The bath needn’t be an elaborate one, as water is the prize, and guaranteed….it attracts birds like no other accessory. Hanging bird baths are a great option if trying to decide on a new bath. They keep birds safe from ground predators because of the height at which they are hung. They’re easy to clean as most are made in ceramic, glass, or plastic inserts that fit in a decorative holder. You have various mounting options with hanging bird baths: any branch, or a shepherds hook, or a mounting bracket from a deck or porch. But the best thing is that they do double-duty! As winter approaches and temperatures drop, hanging bird baths may be used as bird feeders too. And not just for seed, the platform area allows you to feed a variety of treats to birds. Suet, peanuts, mealworms or any mix of food may be used with ease. So change it up according to season, and instead of turning the birdbath upside down for winter storage, help birds to thrive by offering nutritious, high energy foods for them during those tough winter months. Grants Made Possible Through iPhone Apps. DENVER, April 26, 2010 – The American Humane Association awarded a $20,000 Second Chance® grant to the Dublin-Laurens County Humane Society in Dublin, Ga., to help care for 71 dogs that were rescued from an animal “refuge” in southern Mississippi. The Dublin-Laurens shelter is providing medical treatment and care for the mixed-breed dogs ranging from 6 months to 7 years old, which are being housed both at the shelter’s facility and a local boarding kennel. With help from the grant, the shelter has begun the long process of treating the dogs’ many medical conditions — including heartworm, mange, broken bones, ringworm, ear infections, eye problems and advanced dental disease — before they are put up for adoption. The dogs came to the shelter as the result of an investigation and seizure of an animal “refuge” in southern Mississippi, after a volunteer told authorities that conditions there were inhumane and the animals were receiving no food, water or medicine. The Harrison County Sheriff’s Department discovered almost 300 animals that had been living in horribly cramped, dirty conditions for two years, including 205 dogs in small wire cages (sometimes two or three to a cage) strewn across a dirt pit with no shelter from the elements, and 75 cats stacked in crates inside an old moving van. The owner of the refuge was charged with multiple counts of animal cruelty, and all the animals were seized and taken to the Humane Society of South Mississippi. Some remained there for treatment and adoption, while others were transported to shelters in neighboring states, including the Dublin-Laurens shelter. This large grant was made possible by donations made through “shopkick, makers of CauseWorld,” a mobile application available on the iPhone and Android phones. Participants only need to open the app on their phone and check in after entering one of the many stores people most frequent — including grocery stores, hardware stores and department stores. No purchase is required. By checking in, they earn “karmas” from the CauseWorld sponsors. Participants then donate those karmas for specific actions to improve the world, such as helping abused and neglected animals through American Humane’s Second Chance Fund. American Humane is currently seeking additional funds for this vital grant program, and will continue to make Second Chance grants available based on resources and the generosity of its donors. Learn more about how to donate directly to the Second Chance Fund online at www.americanhumane.org/donate, and help animals like these 71 dogs receive a second chance at life. It seems that squirrels are inclined to believe that every single bird feeder in existence is meant for them! So it’s pretty interesting to know this squirrel feeder is also meant for Blue Jays, and Woodpeckers. The innovative design allows for feeding whole peanuts, (peanuts in the shell) to furry and feathered friends alike. Durable, powder coat metal means this squirrel feeder will last for years. Whether you enjoy feeding birds, squirrels, or both, peanuts are a nutritious and welcomed treat. Having a squirrel feeder in the yard also helps to deter the pesky critters from your bird feeders, ultimately saving seed, money and headaches! Does This Look Like a Finch Feeder To You? Not even close! Doesn’t look anything like a finch feeder…no tube, no thistle, no perches. It’s really a woodpecker feeder. Then why is this little goldfinch chowing down here? 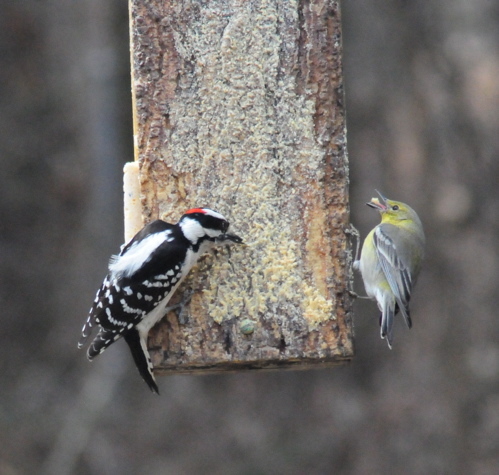 The dull plumage gives a hint – it’s the dead of winter and the suet sure does taste good. Look at the giant chuck in his mouth! Peanut suet with lots of fat and protein with extra calories to help keep warm. Funny thing is, the large finch feeder stays in the yard year-round, filled with thistle seed. But when the temperatures really start to drop, suet is the preferred food of many feathered friends. Now that spring has sprung, that large thistle bird feeder gets filled twice a week, and the finches are eating me out of house and home! Thanks to my friend for this great photo in my yard. They are cute, funny little animals that seem amazingly intelligent. They can figure out almost any kind of bird feeder, and unless you take extra steps to keep food protected and away from them, all bird feeders have the potential to become squirrel feeders. So, if squirrels are so smart, and we like them so much, why do we try to keep them out of our bird feeders? In a word, cost. Bird food can turn into very expensive squirrel food…and might fast too. The little guys can eat about ten times their weight in just one week! The answer may be to provide some deterrents in the way of squirrel feeders for your furry friends. There are a variety available, and they can be filled with inexpensive feed such as; corn on the cob, cracked corn, whole peanuts, or wildlife mix that will keep them entertaining you for hours. 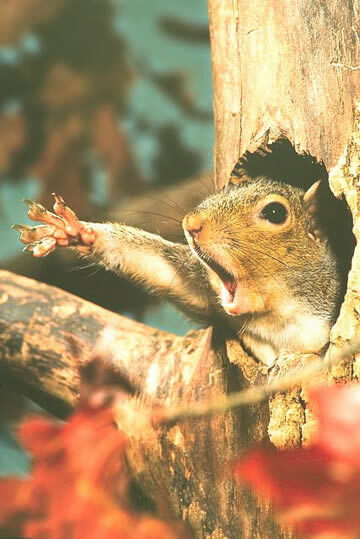 Squirrels are also grateful for many foods that might otherwise become trash — over-ripened fruit, and stale nuts, for example, are a particular treat. And by directing them to a ready supply of food, you may deter squirrels from searching further (and chewing up things like your trashcans). Got Crowds at Your Thistle Bird Feeder? Because of their sweet nature and very gentle disposition, American Goldfinches will quickly give up, rather than fight at a crowded thistle bird feeder. Larger tube feeders are great, but sometimes seed at the bottom tends to spoil. Multiple thistle feeders are a good idea, but can get pretty costly. An inexpensive and effective way to feed lots more finches is using thistle socks. The Finch Magic Thistle Sack is a heavy duty mesh thistle bird feeder with drawstring and toggle lock. Available in three convenient sizes, the black color is wonderful for viewing vibrant Goldfinches during summer months…the contrast is absolutely stunning! Hanging several of these feeders allows many more finches to feed comfortably than with one traditional tube feeder. Don’t forget the nesting materials, as these birds are the last ones to breed and nest, waiting until June or July. And as always, a fresh water source will attract and entice more feathered friends to stick around your place. Got Clumping Thistle Bird Feeders? 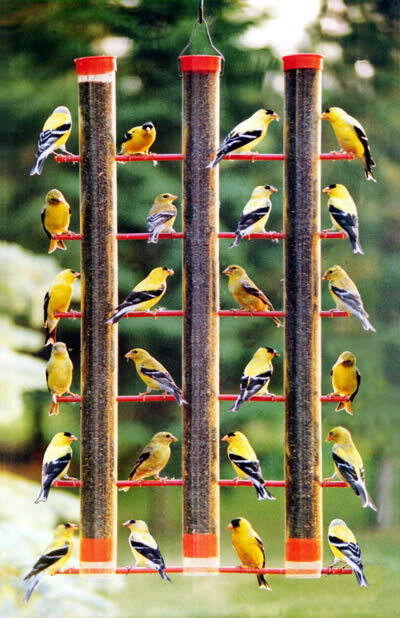 Long thistle tube feeders are great for feeding lots of hungry finches, but many times the seed at the bottom tends to clump, quickly becoming damp and spoiled. Birds won’t eat rotten seed, there’s even a name for this phenomenon. 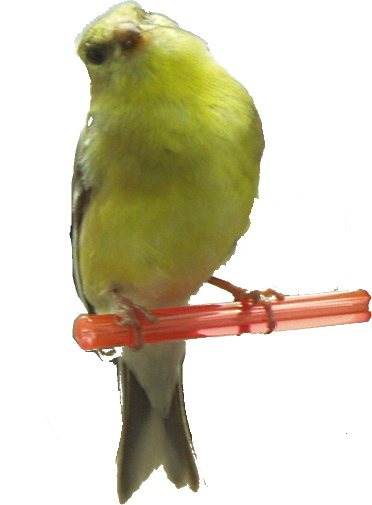 Even seed distribution is the best strategy for any tube style feeder, including thistle bird feeders. The 3- tube feeder shown above allows full view of all 24 birds feeding at once…a pretty spectacular site. Another way to alleviate the “clumps” in thistle bird feeders is to use a few ping pong balls. They work great to disperse the seed more evenly and keep it from gathering quickly at the bottom. A effective and inexpensive solution to clumping seed! Why do they make some bird feeders upside down? Basically it’s to discourage certain birds from that feeder. There’s an upside down thistle feeder made for feeding American Goldfinches only. House and Purple Finches are unable to consume seed from these perches. The sweet nature of the Goldfinch is to give up rather than fight for a spot at a crowded thistle feeder. With the upside down version, there’s no worry of anybody but a Goldfinch at the feeder. Pretty cool idea! They make a suet feeder like that too, it discourages Starlings and Grackles. It also protects suet cakes from the weather. For your next thistle feeder….try an upside down one. Happy Birding!